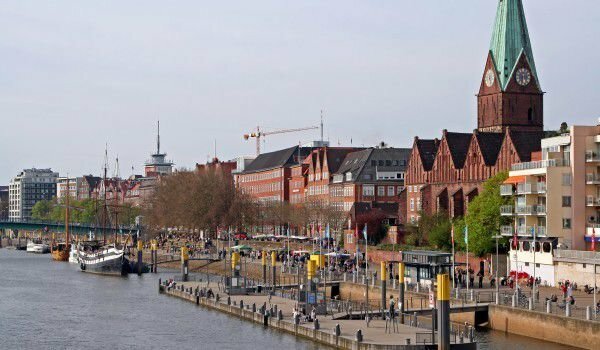 Bremen is kindly referred to as - North Rome because of the great historical and architectural heritage, which is locked between its squares, streets and coastlines. Bremen is also the oldest German seaside town. Located in the northwestern province of the same name the Weser river runs. The whole city covers an area of 325 square kilometers and today, Bremen is as historically valuable as it is a modern developed city. Bremen is the second largest port in Germany and is bettered only by Hamburg. It is quite famous for its Bremen Town - Musicians river city which is located 112 km southwest of Hamburg and 122 km northwest of Hanover. Bremen has ever been known by the name - Old Town gray river. The enormous political significance of the city is shaped by its membership of the Hanseatic League, as during the Middle Ages it was one of the most powerful members. Resettlement of land around Bremen began in prehistoric times as they have found evidence of human skeletons dating from 10-12000 BC. The medieval history of the area began in the 7th century when Charlemagne established dominance over local Saxon tribes. It is in this time for the first time that Bremen was mentioned in historical texts. On 10th August 965 Emperor Wilhelm I had given commercial, coin law and customs law of the Archbishop of Bremen. In the 11th century around the city appeared the solid fortress which should protect Bremen from the Channel invasion. The first annual Free Market took place on October 16th, 1035. This is the oldest free market in Northern Germany and today is celebrated annually on the Old Market Square - Marktplatz. Around it are many architectural and historical masterpieces of Bremen. Some of the buildings that surround the square have been standing there since 13th century, for which the market square in Bremen was declared by UNESCO as a monument of world heritage. One of the notable buildings in the square in Bremen is the building of the city council, called the Rathaus. It occupies a central place and was built in the early 15th century. A little later the original Gothic architecture of the Bremen Rathaus was transformed into a style Weser Renesmee, which in the 17th century was especially popular in Germany. Against the city council, on the opposite side of the square is the building of the guild - that combines an architectural point of Renaissance and Gothic style. Along with these historical monuments in Bremen, stands an impressive building of the Bremen Parliament - House der Bürgerschaft. That building was built in 1966 and is notable for its facade of glass, steel and concrete. One of the main streets in Bremen is Böttcherstraße. It departs from the historic city market and reaches the river Weser. This historical and modern intertwine has been since 1926 when the brick pavement of Böttcherstraße was officially opened. After World War II it was rebuilt. Today, this landmark of Bremen Street has many cafes, restaurants, shops, art galleries and studios. In the center of Bremen rose an intriguing statue. It is known as Roland, who holds the sword of justice and shield. The statue is nine meters high and is considered sacred.